The Red Arrows are regulars but will not display in 2019 because of their planned tour of the USA and Canada. A free seaside airshow with afternoon displays of classic and modern aircraft over two days, centred to the left of the Northern Victorian pier. 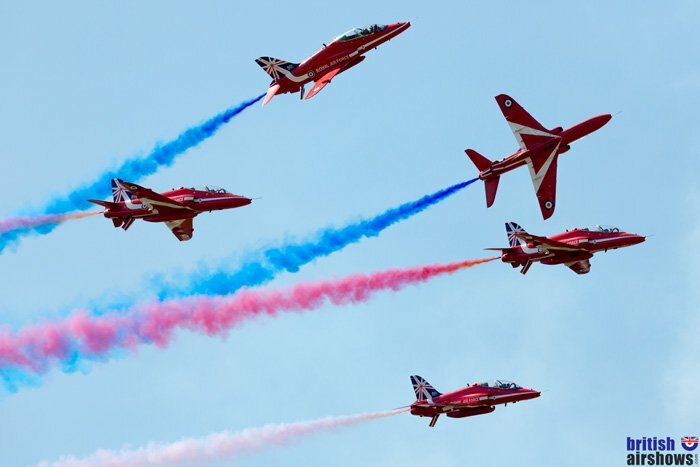 Although the Red Arrows will not display this year, because they will be on their North American tour, jets will nevertheless feature impressively, with two of the most popular teams: a rare UK appearance by the Breitling Jet Team and the ever-popular 'Bring on the Noise' RAF Typhoon. Everyone's other favourite,, the RAF Chinook, is also scheduled to display at Blackpool, one of just 13 locations nationwide to secure the display in 2019. Use sat Nav FY1 4BJ until you get close, but ignore the sat nav in favour of local directions signs as soon as you see them. There are links to route planners in the Travel Advice column if you prefer to plan ahead or don't have sat nav. Blackpool is well served by National Express. There are routes from many towns and cities including Preston, Birmingham, Manchester, Bristol, Taunton, Stoke, Plymouth, Yeovil, Weymouth, Bournemouth, Liverpool, Bradford and places in between. Click the blue National Express to go to their web site. There are direct services to Blackpool North from Manchester, Liverpool and York. Services from London Euston, Birmingham, Glasgow, Edinburgh and other major cities go to Preston, from where there are about 4 trains an hour for the onward journey to Blackpool. Click the blue Expedia name for a list of hotels and guest houses near the show. The venue is already built into the links but when the list comes up you will need to enter your dates and adjust the number of rooms and guests, if necessary. The International Hotels Group do not have a Holiday Inn or Holiday Inn Express in Blackpool itself, but there is one Holiday Inn and one Holiday Inn Express hotel in Preston, about 15 miles away. There is a Premier Inn near the beach; another two within three miles and a fourth in Blackpool East.